Throughout these 12 years as president of Bolivia, after clarifying he is first the president of the six federations of coca growers of the Chapare, so that his loyalties be known first. He not only destroyed our economy, he wasted over $160 billion dollars, but made narcotrafficking, and smuggling of goods to bloom during his presidency. There are over 600 Bolivians that had to fled the country, due to political persecution. Many journalists and media had to stop reporting on his wrongdoings to avoid biased trials against them or no access to propaganda paid by this government to make ends meet. He self-proclaimed as Mother Nature’s defender, but his actions say otherwise: he let police brutally assault indigenous people when they raised their voices to protect their own habitat at TIPNIS. He is building a dam that will seriously damage our most biodiverse National Park, the Madidi. He pushes to drill wells in Protected Areas, he does not care about environment and wildlife! Bolivian people in a Referendum said NO to his 4th intent to run for elections, which is even forbidden in the Constitution he imposed, he wants to remain in power, to continue to enjoy luxuries, boondoggle trips and to avoid trials on his ineptitude and corrupt government. 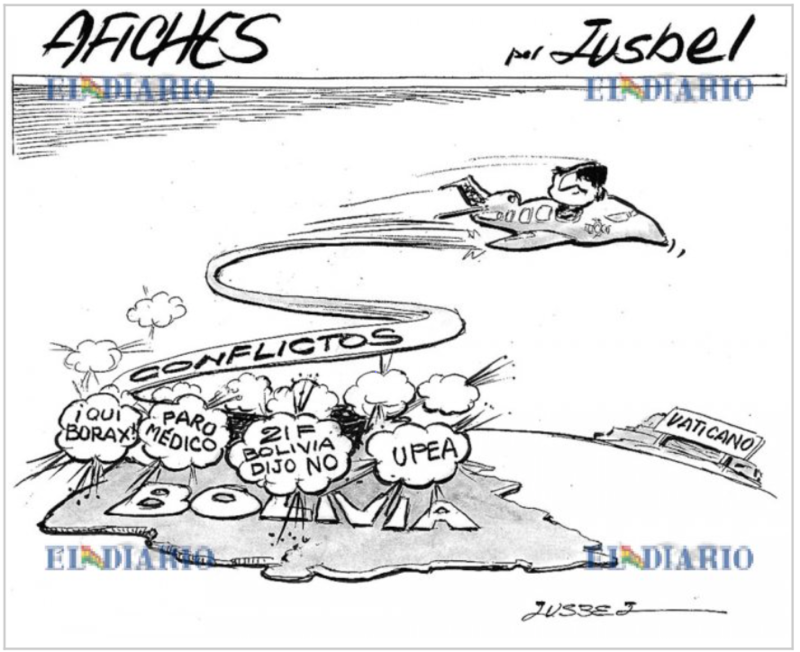 This cartoon from El Diario, June 28, 2018, reflects his true nature! Our international prestige as a law-abiding country is hitting its low ever. He destroyed our meritocracy and imposed ochlocracy! … this is evo!